We proudly operate in the Pacific Northwest, partnering with local operations to create quality black angus for you to enjoy. Our cattle are born and raised on our 550-acre ranch, located in Warrenton. We have not brought in outside cattle for several years, with the exception of our bulls. 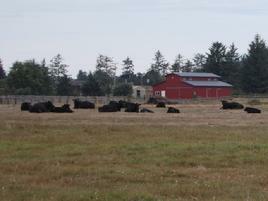 We raise our own hay for feed throughout the year, and our grain-finished animals are fed corn from Tillamook, OR. We rely on the advice of our local veterinarian for best practices regarding herd health. Our all-natural, humanely raised animals are processed at an offsite butcher in the Portland area. Price includes cutting and vacuum packing for great freezer life. Special requests are available for animals not yet butchered.